On Sunday the 21st May as the sun was beginning rise the Walkers Bulbs team were driving up from the flat land of Lincolnshire and into West London that is home to the world’s most prestigious flower show, RHS Chelse a. Arriving at 6am there was lots to get done before the gates opened to the judges on Monday morning. With over 150 varieties of daffodils grown to select the final cut it had been a busy couple of months of preparation to even get to the gates, with The Lincolnshire based daffodil man with the Midas touch putting together a display of daffodils later than nature would normally allow. Once on site it was then all hands to the pump as the daffodils were arranged in 70+ bowls of which 69 made the final display. 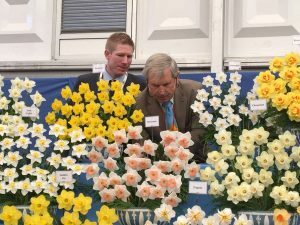 It turned out all the preparation was worth it as the specialist daffodil collection of Taylors Bulbs worked their way through yet another nerve racking and tense build-up to strike gold for the 24th time. This year’s Chelsea saw temperatures soar and the pavilion where the Daffodils were displayed was at times uncomfortable. 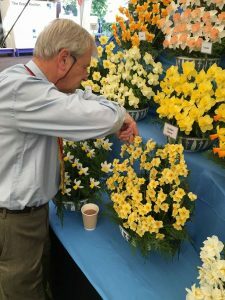 Sallyanne Foreman explains how the weather affected the display this year ‘Visitors were amazed and astonished that d affodils were holding up despite the weather but on Wednesday you could see the flowers wilting in the bowls as the day got hotter. Paul French brought down fresh flowers on Wednesday and Friday nights after the show hadfinished enabling us to replenish the bowls’. As the show came to an end the team could reflect on the huge achievement not only for the company but also for the humble daffodil which graces many of our gardens, roadsides and woodlands each year. O.A. Taylor & Sons Bulbs Ltd.